Designer’s Interview 3: MariaElena Barbosa, Beatrice Serensipity, Kimmera Madison, Phedre Rexie, Shanty Bookmite, SlackGirl, PinkRayne, Shine Messmer, Carter Christenson, LyricalBizarre Resident, Snookiemacintyre, Kim Saunders. Joeylin, Lam ErinP – .PENUMBRA. .PENUMBRA. will be presenting fashions designed by Second Life designers for Spring/Summer 2015 for an entire week in May of this year. 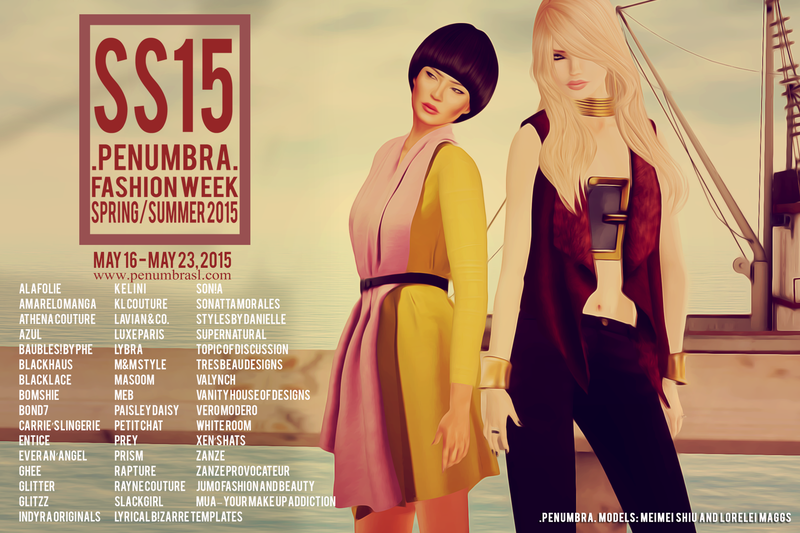 This bi-annual Fashion Week will feature creative and unique designs from over 50 of SL’s best known designers. Along with models from .PENUMBRA. Agency, the modeling arm of .PENUMBRA., shows will be held from Saturday, May 16th through Saturday, May 23rd at a brand new event venue. Each show will feature several designers whose designs are from the same category. The finale show will feature a “bridal” theme. New this season, we are including makeups and other fashion accessory items. What would you be doing if you had not ventured into fashion design? I love to explore SL and see what all the creative people out there have made. I love seeing beautiful sims and used to love shopping in SL so I’d be doing some of that for sure. What was the inspiration behind your upcoming collection for .PENUMBRA. Fashion Week SS15? Spring flowers, shells and carousels. Can you tell us a bit about how the brand has grown over the last year? Baubles! used to be more of a costume jewelry store that had tons of girly things and appealed to a bit of a younger crowd I think, or to people who enjoy fun accessories that don’t need to be overly fancy. I still like to create fun jewelry and try to be different in my designs but I feel like Baubles! has taken on a bit more of a mature look over the last year or so, while still appealing to a wide variety of customers. I don’t really have a specific “style” or “theme” that I create in, it is just whatever comes to mind so hopefully people appreciate my randomness lol. Which of the following super-powers would you choose: flight, super-strength or telepathy? What has been the biggest highlight of your career so far? “I think it have to come yet, I work with my staff everyday to improve my skills and my products and we are sure that each day will be better of previous for both us and for our costumers. What advice would you give to aspiring young designers? Don’t give up! NEVER! Gives to your passion and to your creativity all yourselves without saves.. You’ll fall, will be angry, sometimes you’ll feel the needs to take your PC and throw it down to the window but DON’T GIVE UP! The satisfactions will come but ONLY with constance, dedition and PASSION. The Passion is the motor of anything and, for sure, also of your SUCCESS! The freshest bride on the world, the clean and the elegance that all the brides could have is what has inspired me above any other thing. Which one of your favorite celebrities would you most like to switch bodies with for a day, and why?. Would you rather be smart, pretty or wealthy? What is your favourtie alcoholic Drink? I trieed to keep my personality show my moment mood.. Not Really like an Inspiration. My SecondLife carrer is really Short for now .. i’m Creating here there are only 5 months so every step i do for me is an Highlight .. for now. Never Give Up, and Never think is enough the work you Done till now. What is the most challenging thing about creating SL Clothes? Mesh Mesh Mesh Mesh, LOL. 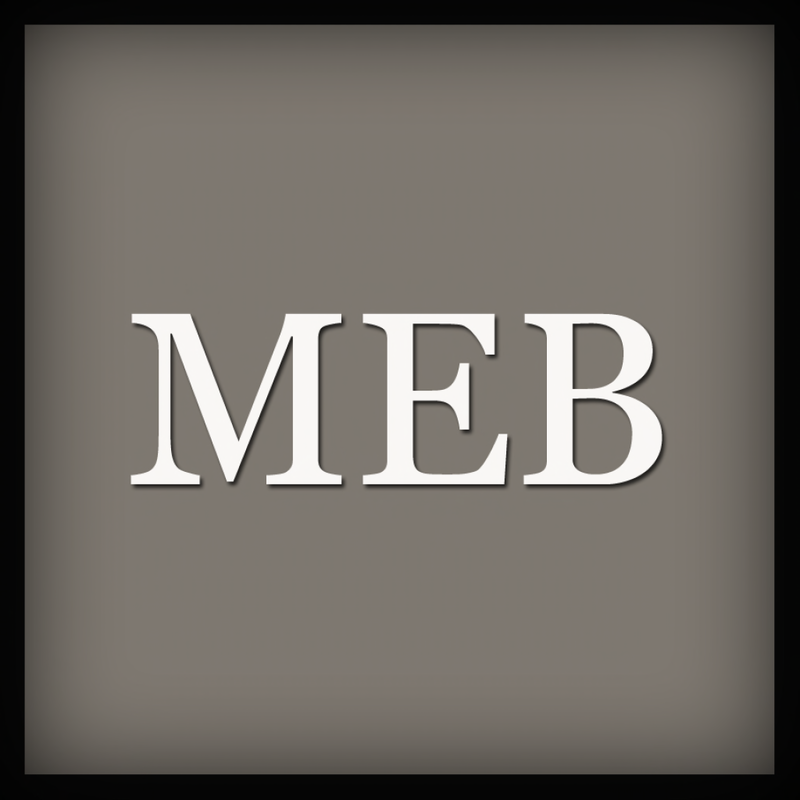 I have been buried deep in the pursuit of learning to create mesh and the rigging of it…My hair is turning Gray and my hairdresser is ever so grateful for the additional business. Do the work! Meaning, don’t settle for the easy road, learn, evolve and challenge yourself. Give us four of your favourite things. Smart, your brain controls all that you are. Pretty is in the eye of the beholder and Wealth can be achieved. The highlight of my career has been seeing my designs on the PENUMBRA catwalk. It’s always one hell of a moment, and the shows get better and better. When I see those gorgeous models working my designs for the most professional fashion company in SL… I kinda have to pinch myself. It’s then I realise “hey, they’re really mine, I have made it”! My fashion line started out as HOLY SHIrT! As I became more skilled in texturing and designing, I decided it was time for a make over, and RAYNE was born. RAYNE is the older sister of HS! Luxurious, stylish and super edgy! Don’t expect to “earn” money with it. Probably most of us, designers, do this for the love of fashion, for the willing of developing creativity. How many rings to answer the telephone? Who are the RL designers that you really admire or are inspired by? I’d probably still be modelling, blogging and working for fashion magazines and agencies as a stylist – I might have been teaching SL modelling too by now – one things for sure, I would have kept busy! Seeing my designs on the runway worn by some of SL’s top models has been a huge thrill for me – particularly during the recent Ghee Girl 2015 contest, where some of the styling we saw was stunning and so creative. I joined Warm Clarity at Ghee as a designer just over a year ago, and I think we have really evolved as designers and as a brand. For me, it has been a year of continual learning and development of my skills – I can easily look back and remember struggling with things for hours (or even days!) that I can now do pretty fast. As a brand Ghee has participated in our first fashion weeks, and many events, our VIP group has more than doubled, and we also held a contest for the first ever Ghee Girl – face of Ghee, which the amazingly talented Astralia won. Wow hahahaha good question. I would probably be a surf bum. Surfing is all I did when i first logged on SL. Anyone that knows me knows I love suit with multiple combinations and variations of how you can wear it. Something that is modern and sleek with a British feel. That’s what you will get with this collection. 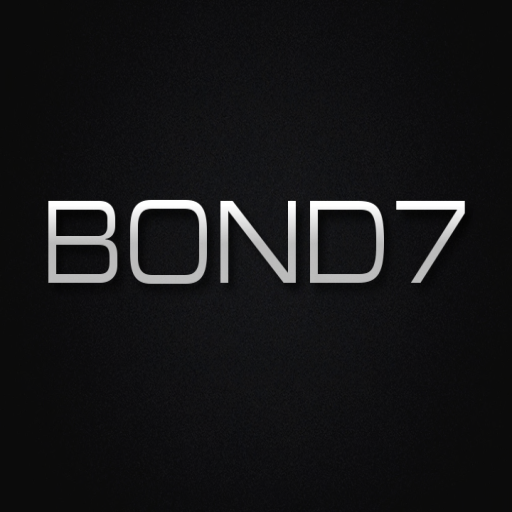 BOND7 is the second brand that i created on SL. It’s only 4 months only but the response has been great! My customer base continues to grow daily. I must admit, I cannot mention one designer I am most fond of. I see glimpses of magic in some collections, and a lack of inspiration in others. I prefer ethnic influences, even if re-organised and re-vamped, from a selection of RL designers, but have found myself deconstructing the major brands, after seeing them in showrooms and fashion shows, and thinking that the magic is gone and mostly to do with good models and brilliant camera action, rather than unique intricate designs. The frustration between a market seeking mesh and only mesh, and it’s limitations. When a design idea is born, you see this ethereal creation, that moves and floats and gives you the feel, although virtual only, of something magical. Which, unfortunately, only lasts while you are posing. There is much to be said about the freedom mesh brings to virtual, though. There is also much to be said about the difficulty in finding that perfect balance between motion and sculpture pieces. I have been blessed, though, with a market of people thinking outside the box. Being asked to aid in formal and national gowns and attire for pageants in SL. Not for the reason one would think, though, but for the connection I have made with the ladies who asked. I believe friendships were forged, far beyond the designing world, and I was able to find out much more about a selected few, from their inspirations. The highlight was, thus, the gained ability to discover a personality via interests, discussions and unique mentalities. In other words, deconstructing fashion into frame of mind. Dream. Nope, there are no limitations, but your own fears. If you want to make a giant, half sim outfit or gown, with intricate detail and stunning movement, do so. It might not be practical, but you will give someone the feeling they can stand proud in an unique creation. I strongly feel the brand has grown quite exponentially over the last year, and I am blessed to discover new limits I can cross now, with the gained experience. Although little Lyrical has much to learn still, there is eagerness to do so in everything. If not for Sl Fashion Design I’d like to think that I wouldn’t even be on Secondlife, and I wouldn’t have the extra financial backing that it also provides in RL. The most challenging obstacle I find on Sl is being original. Everyone gets their inspiration from the internet, and I’m sure we all end up making the same things. But what I try to do is change it up a bit with a cut here a slit there. That way I know I at least tried to be different. My advice to all aspiring designers is don’t give up. It may be hard in the beginning but later down the line its well worth it. Telepathy Simply because it would help a great deal with tardiness. Can I pick more than one? I’d like to be smart. That way I can use my smarts to make my fortune. Designing items for homes. If I were not into fashion so very much (I simply love it! ), I would be the home makeover queen. Chic, affordable, spring and summer fashion for day and evening. 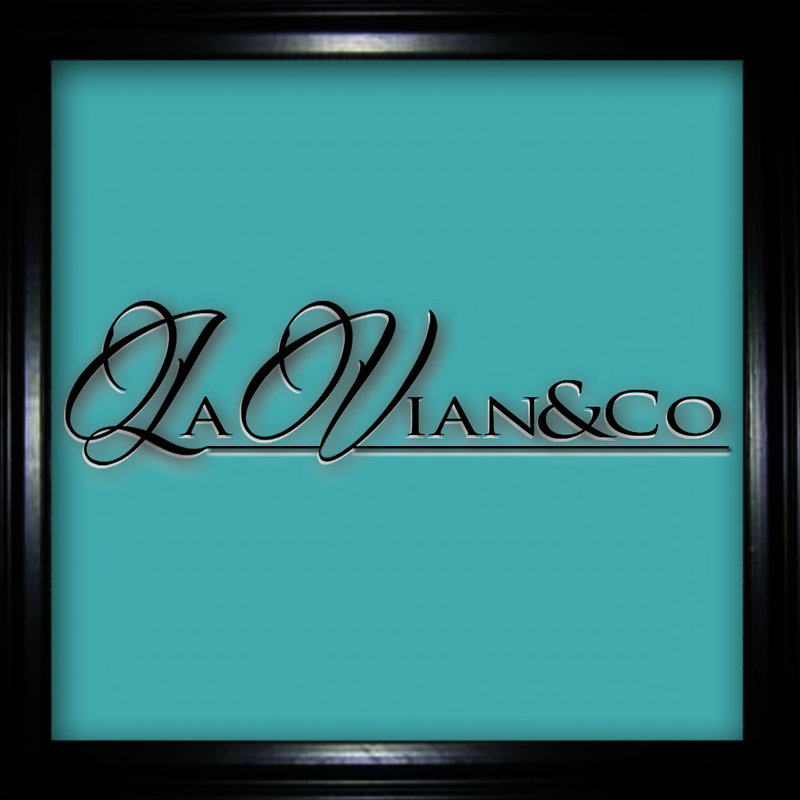 LaVian & Co. is an out growth of LivGlam which was a conglomerate of designers. Deciding to not be a conglomerate is always a risk. I’m more than pleased with the response and especially the continued faithful customers. House, wardrobe, Ralph Lauren items, shoes. Smart and pretty! A girl can be both. If I had not ventured into fashion design, I would probably not be logging into second life much at all anymore. I’m sort of a recluse and seeking socialization here is not my strong point. I do admire the beauty and poise of many of the sl models and the talent and again beauty of many bloggers and photographers. They have such great idea’s to make our designs look the best they could be. So, doing what they do, would be interesting. Don’t be afraid to try something different than what everyone else is doing! Set your own trends! Be sure to advertise yourself/brand wherever it is possible. They won’t be at your shop if they don’t know about you. The most challenging thing for me about creating SL clothing is after you have created it. Setting it up in 5 copies (mesh), correct permissions, vendors and photo’s. The boring time consuming bits that sometimes can take a whole day after doing the fun creating bits! Wealthy, I can then buy the other two. I would be involved more in photography and sim designs, which are two other areas of SL creative interest. The most challenging is to create unique creations with distinct identity. Both take time to develop and a lot of effort. To be stubborn and never give up to the many early difficulties. Also that success comes to those who love what they are doing. I’m pretty stoked to be walking the runway in the SS15 .PENUMBRA. Fashion Week! It’s been way too long. Check out the interviews of some of the amazing and talented designers who’s designs will be featured in this tremendous production. Reblogged this on Payton's Picks. Score Big with these Memorial Day New Releases at Sneak Peek!